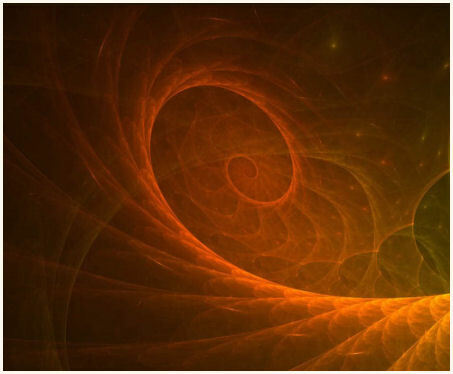 There is a theme at our social network site, reflected in the title and a number of images used throughout, which refer to time or a circular continuity thereof. The background theme shows a Nautilus spiral, the logo which has a backdrop of a ring can be viewed in its original form on my own profile is shattered by a bolt of lightning in one particular area… representing the idea of time literally being “no longer”. All of this has a certain point of reference which i will explain here. In Ecclesiastes an interesting observation is made which probably doesn’t often get mulled over in terms of being a literal statement. This is a very enigmatic statement which is understood in a mostly figurative way by readers now, in pertaining to the shortsightedness of humankind and their tendency to repeat the mistakes of the past… but it doesn’t really read as a figurative statement, does it? It has already been in ancient times before us… there is no remembrance of former things. Satan is no simple-minded creature. Iv’e often heard it asked among believers how Satan continues to war against the Almighty knowing full well that he can not win… or at least having every reason to know full well that he can not. It begs an answer… because he is not without great intellect, and because he has had enough experience in knowing the nature of his Creator to understand the magnitude of the power he is up against, there must be a plausible reason that he has some hope (a deluded hope though it might be) of achieving his goals to usurp His position. What Satan realizes, and has realized since the moment that YHWH cursed him and predicted his downfall, is that there is an inevitable finale to his existence and the only way to have a chance of bypassing this finale was to somehow circumvent the process of time entirely. You might be tempted to automatically say “That’s impossible… the Creator would not let him do that.”, but we can’t dismiss the fact that the Creator has allowed the freedom of his creation to choose to act upon good or evil in whatever their capacity is to do so. This does not mean that such a measure… or any measure, no matter how grand, can ultimately defeat His will… but sinful beings can try. Time travel and dimensional travel was, not so long ago, an entirely fringe notion to most people… the stuff of science fiction. It is now receiving public attention by such esteemed scientists as Steven Hawking, who brought up the CERN LHC as an example of how real time travel might be achieved. I would suggest that the LHC was built precisely for this purpose however, and not a foremost effort to locate the Higgs Boson. Time travel has been achieved decades ago in the aftermath of an incident with a ship called the USS Eldridge and the Philadelphia experiment. In the process of what was done to further experiments like this, it was found that a loop was created between the dates of exit and re-entry which linked those time frames together like a circuit, until the equipment which perpetuated the experiments was destroyed. It was a small time circuit of only about 40 years… but this leaves us with the knowledge that such a loop could be created between two points of time that were vast millennia apart. 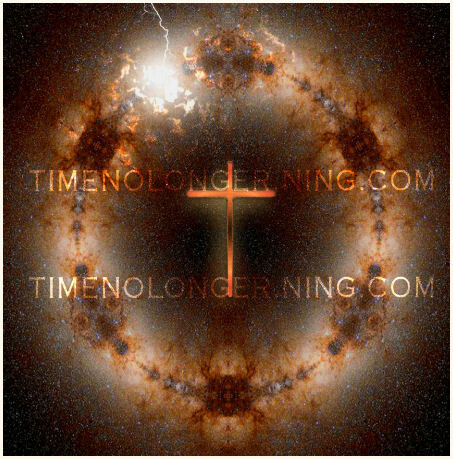 A massive time loop which connects the introduction of sin to creation with the last viable moments of Satan’s reign of freedom on Earth in a cycle which repeats itself (endlessly, Satan would hope) is not as crazy of an idea as it might seem. It is a concept represented over and over again from antiquity to this day, and a symbolism which is held in high importance by the Luciferian elite. Circular time, which rebirths itself at the end of it’s turning, is observable in the real phenomenon of the precession of the equinoxes, in which the sun rises throughout the ages at precise zodiacal points at the vernal equinox, preceding slowly in a circle as if it were the hand of a giant, cosmic clock. Upon the knowledge of this celestial activity are such ancient time keepers as the famed Mayan calendar established. 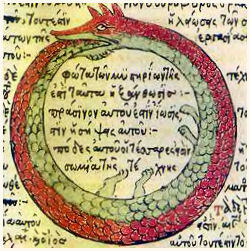 The repetitive time cycle is represented by an apt symbol… the Ouroborus. This symbol shows a serpent or dragon which is coiled in on itself in a circle and is devouring its tail. Satan, as we know… is the serpent or the dragon, and this symbol is a reference to what he has to do with time and the repetition of it. It is known as the symbol of eternal return and it and a similar representation of the same, a spiral, can be noted as persisting to this day in that strange, hieroglyphic language of symbols that appear as common logos for companies, institutions and agencies which the elite control. This is the demented hope of fallen angels… that they will ensure the continuation of time in a loop which bypasses all accountability for their actions and at the same time keeps the Earthly domain, which was sold under sin, in their possession. What they did not account for was Messiah and His intervention in the manner which He did, doing what had never before been done in His act of sacrifice. This introduction of a truly New thing by necessity changes the landscape of a time-state which can not in its intended purpose produce utterly new events. If such a notion as a forced recycling of ages is understood in the magnitude of what it means scripturally… this means that the intervention of Messiah and the end of the age not only mean the redemption of saved individuals from a sinful world and the end of sin… it means the final cessation of time itself as it is now known…the cessation of a corrupted chronology. The New Heaven and the New Earth would be creations within a new definition of what time means… eternal, never returning to it’s beginning but stretching out in unending progression of perfection. This is why i look forward to the day when there will be “time no longer”.